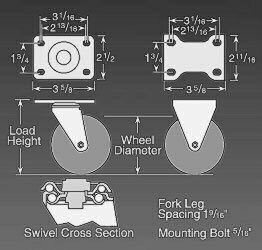 Top Plate: 2-1/2" x 3-5/8"
Bolt Spacing: 1-3/4" x 2-13/16" to 3-1/16"
Medium duty high performance caster at economical prices. The non-marking wheel varieties are perfectly suited for all the material handling conditions out there. Wheel brakes, total lock brakes and rigid models available.